Moore General Hospital, located between Swannanoa and Black Mountain on U.S. 70, was built as a general army hospital for the treatment of sick and wounded soldiers during World War II. Named for Samuel Preston Moore, a native of Charleston, S.C., and surgeon general of the Confederacy, the hospital complex was designed to include numerous buildings, 1,520 beds, and a full-time staff of 1,500 people. Government engineers envisioned it as the "Walter Reed of the South." Supervised by a private firm from Asheville, construction of the hospital began in May 1942, and the first patients began arriving the following November. Col. Frank W. Wilson was the hospital's first commanding officer. In addition to the buildings for patients and staff, the site also included 36 structures to house men in training for service with the medical corps; the first training unit assigned there was the 28th General Hospital. A rehabilitation center, which officially opened in June 1944, was added when the hospital took over the new Sand Hill High School building in West Asheville. In September 1944 the facility expanded to include a Tropical Disease Center capable of treating an additional 1,400 patients. In May 1945 German prisoners of war were brought in to provide maintenance and other labor services; they were housed in a separate camp on the north section of the hospital grounds. In September 1946 the U.S. War Department declared Moore General Hospital a surplus facility, and it was taken over by the Veterans Administration. For several years it was known as the Swannanoa Rehabilitation Center, an annex of the Oteen Veterans Hospital, and served as a tuberculosis rehabilitation center. In 1960 the Veterans Administration consolidated its operation at a central location in Oteen, and the Moore General Hospital property was deeded to the state of North Carolina for use as a juvenile evaluation center. 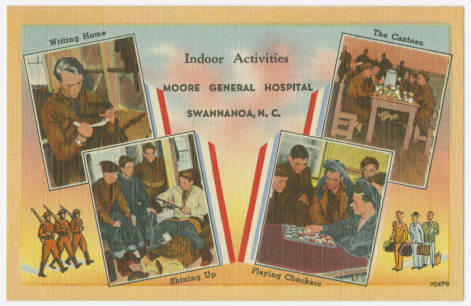 "Indoor Activities, Moore General Hospital, Swannanoa, N.C." Image courtesy of the North Carolina Postcard Collection, UNC-Chapel Hill Libraries. Available from http://dc.lib.unc.edu/cdm/singleitem/collection/nc_post/id/9208 (accessed August 30, 2012). Is it possible to find out why my Grand Father at the hospital during WWII? I understand there are HIPPA rules, he has passed and I am told he may have been wounded by gunfire in New Guinea but I have no proof. I want to honor him and would to find out if my information is correct. I have written to the National Archives only to find his records were destroyed in a fire. Thank you for visiting NCpedia and for taking the time to share your family history and question. I am forwarding your question to reference services at the NC Government & Heritage Library. A reference librarian will contact you short to try to help. My dad spent some time there as a returning soldier and would often talk fondly of the hospital. Thanks for keeping history alive.